Sometimes, everything goes beautifully in the lab: Your equipment works perfectly, your data sets are neat, and your results eminently publishable. And then sometimes, everything goes horribly, horribly wrong. These lab stories are all firmly in that second category — and, yes, there WILL be fire. When this little sheepy was about 10 or 11 years old (over 30 years ago! Yikes!) I built a radio that could fit inside a tic-tac box. It had a headphone socket, copper wire wrapped round a magnet, a circuit board of some sort I'd made and it was powered by the earth! (Two wires protruded from it, and you stuck these into the ground and it powered the radio). I thought I'd see if I could power the radio some other way, and decided it'd be a good idea to stick those two protruding wires straight into the mains. I thankfully avoided an electric shock, but the poor radio blew up with the loudest (And closest) bang I'd ever heard. A long LONG time ago in a 1st year of High School Chem Lab. (Small town school, first time most of us had a chance to TOUCH equipment.) Mr Wong was taking us through a set of basic techniques to get us used to working in the lab. Something like the 4th piece of the set of experiments was heating iron filings and sulphur(?) in a test tube and then plunging the hot tube into a beaker of water. It would shatter, of course, and yield Sulpher Ferrite or something. (He wanted us to get used to idea we could be expect the shattering during more complicated experiments and not be timid as long as we were careful.) My partner and I talked and thought "Let's put the water beaker IN the sink, to contain the shattering pieces. Aren't WE thinking Safety!" Unfortunately, the 3rd experiment had involved something quite flammable and the class had dutifully poured it down the sink at the end of the experiment. 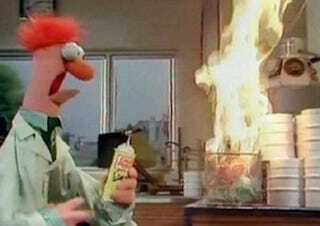 So, it went down like this: Our test tube shattered and set fire to the material in our sink. It was only a few mils so it was mostly FLASH/BANG but ... all the sinks in the lab were interconnected so this chain reaction of FLASH/BANGs started moving outward from our station until they all went off. (To this very day, I can see my friend Tara's face as she realized the inevitable, the effect marching across the room to her station in the front, left corner.) Mr Wong was cool about the whole thing but I was "the guy who blew up the chem lab" through high-school. Not the best but the most memorable. First lab experiment of my Chem degree. Mind numbingly boring experiment to make a polymer. The year split up into groups of four. You had to keep heating and HAND stirring a noxious cocktail, reaching into the fume cupboard for THREE hours – each of us taking 15 minute shifts. Once the polymer solidified it became like blu-tac. We then had to roll it into a ball and drop it next to a meter rule. By measuring how high it bounced we could work out its purity and then we had to hand in the sample with our results. We finished and watched the group behind us drop their ball, see it bounce right up in the air, land in the chemical sink and roll right down the plug hole. I sadly can't remember the exact specifics of the experiment, but it involved running propane from the gas taps over the reagents as a catalyst. The propane then had to be vented off safely (lab full of propane = bad idea) so the test tube with the reagents had a little hole in the bottom and was clamped sideways, allowing the escaping propane to be lit and happily burn away with a little inch high flame. My lab partner and I were the first pair to get to that stage, so when the time came to light the propane I looked to my partner to ask if he wanted to do it and he gave me a cheery wave from the far corner of the lab. So I grabbed the longest splint in the box, lit the end, brought it close to the hole, and immediately produced a two-foot flame that nearly had my eyebrows off. The teacher rolled his eyes and calmly reached over the bench to turn my gas tap down. That may not be quite the best experiment I did (making a solution that was red and blue AT THE SAME TIME at uni takes that crown) but it was certainly memorable! Have your own tale of woe and danger from inside the confines of the lab? Share it with us in the comments now!